NOTE: This report was previously published in the www.climber.org archive. Here's a 'retro' report from a few years back. I don't remember the exact date, but I believe it was May of 1993 or 1994. Unfortunately, I have no record by which to verify the date, as the summit register was buried under snow. My friend, Gary, and I had been backpacking and rock climbing together for a few years, and he suggested we go to the Sierra and climb a peak. He had all kinds of suggestions, all of which sounded far above my meager abilities. I suggested a slightly less technical, though nonetheless arduous, route. My brother had climbed Mt. Langley from Cottonwood Lakes a couple years previous, and gave a glowing report upon his return. Having viewed the mountain constantly when I visited Cottonwood Lakes, I was already curious. When he showed me the pictures from the summit, I was shocked - I had no idea all that alpine splendor was just on the other side of the ridge from the Cottonwoods. I had previously visited Tuttle Creek a few times, and twice approached the long east ridge of Mt. Langley, both times being defeated by time constraints and poor planning. The poor planning was partly due to lack of knowledge of the route and the area, and also due to deficient backpacking strategy. I have since learned there are things you just don't need in the eastern Sierra, and these things now remain in my closet when I pack my pack for a trip. On one of my trips to Tuttle Creek, I noticed that the terrain on Langley became much more interesting above 10,500 feet. This little glimpse of paradise wedged itself into my gray matter, and when the subject of peaks arose, I remembered what I had seen. We arrived at the Tuttle Creek trailhead and geared up for the hike. As usual, Gary brought his dogs, so we had 'pack stock' to assist in the portage of gear. The long, dry slog up to the Stone House went by quickly, and soon we were resting in the cool recesses of this magnificent shelter. The views of the south face of Lone Pine Peak were far more impressive than any single formation I had seen in Yosemite. The size and proximity were overwhelming. We left the Stone House and began the bushwhack up the south fork. Following a use trail, we quickly gained the creek and crossed. As we did so, we entered the cool depths of the fir forest. Huge white fir trees towered overhead, some probably as old as 400-500 years, and up to 4 feet in diameter. The going was loose, and we tried to follow the braided use and game trails, with little success. As we neared the transition from fir to lodgepole forest, we entered a zone of willow thickets and braided streams. It was quite a thrash, but beautiful. I was reminded of an adventure I had many years ago, when another friend and I hiked up Horse Creek Canyon from Twin Lakes near Bridgeport. The forest was just as dense and cool. The music of water was everywhere, a lavish accompaniment to the twitter and chirp of birds hiding in the trees. Lodgepoles loose less dead vegetation that do fir trees, so the nice pine duff gave way to quartz-rich sand. I have since taken to calling this kitty-litter "The Quartz Crucible." This nickname presented itself when I was slogging up the southeast slopes of Lone Pine Peak, being cooked from the underside by sunlight reflecting off the white sand. Hour after hour slipped by as we trudged up the broad, sandy avalanche chute leading to the crest of the ridge. At about 11,500 ft. we entered a barren bowl with some boulders strewn about. At the back of the bowl, framed between buttresses of shattered rock, was a steep snowfield leading to the top of the ridge. I have a nickname for this place, too - "The Langley Gate." We found a group of large boulders sheltering a sandy flat spot and made camp. The sun was beating down mercilessly, so I erected my tent fly and Gary tied the dogs up underneath. 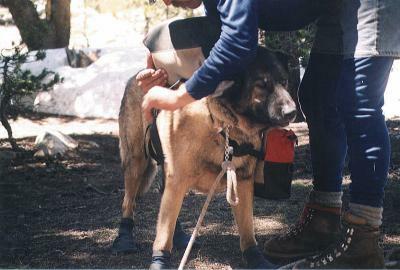 We hastily packed small day sacks and bid adieu to the dogs, then began the wet-footed romp up the snowfield. At the top, we gained a large, slightly tilted plateau between Tuttle Creek on the north and Diaz Creek on the south. Nearby was a truly gargantuan duck - stones had been stacked by so many passers-by that this loose pillar stood nearly 8 feet tall, not including the 4 foot high boulder on which it stood. Gary now took over as 'leader' and we aimed for the sharp upper portion of the east ridge. This final crest was where the actual 'climbing' began. We scrambled along the southern side of the crest, along ledges and boulders. Twice I had to work around bulges of rock that obscured a good ramp we followed. The exposure wasn't too kindly here, either. I was looking at about 150-200 feet of rough and less-than-vertical cliff below. Where the crest abutted the summit plateau, we made a left turn and traversed to a point nearly underneath a gigantic square block balanced on the southeast corner of the summit plateau. Just to the right of this block was a crack leading to the top. Gary zipped right up this crack and stood on top, looking down as I repeated the move. Near the top, the crack was packed with ice. I couldn't grab the nice edge at the back of the crack anymore. I did a tricky stand-up on what footholds I had, then did an even trickier mantle, feet slipping on the ice, and gained the plateau - whew!! We were now at 14,000 feet, and the landscape on this plateau was weird. The rocks were of a reddish but quartz-rich granite, and were severely weathered into bizarre shapes. Huge solution pockets were worn into the boulders, some completely boring through the rock. We reached the summit, although it was nothing more than the high point of the convex plateau. We were, however, right on the edge of the precipitous north face, and could look down onto the dizzying aretes and towers and gullies dropping into the rubble-filled Tuttle Creek canyon. The register could not be found under the heaps of wet spring snow on top, so we have no proof of ever being there, except a couple pictures. The views, of course, were jaw-droppers. The ever-impressive Owens Valley lay east, the Whitney group shining in the sun to the north. To the west, the Great Western Divide stood above the green depths of the Kern Trench. South of us, the Kern Plateau seemed to stretch on forever, with meadows and cone-shaped peaks and dense forest. After our summit reverie, we were ready for dinner. We took the easy route off the summit plateau, heading west above the southern chutes, then dropping down to the lower plateau on the southern side. We then headed east and crossed 'Diaz Pass' - a nonchalant saddle - to regain the route back to camp. As we neared the Big Duck and the drop-off back to camp, we saw movement among the rocks on the northern edge of the plateau. Bighorn sheep!! We cautiously edged nearer, and saw that it was indeed a relatively large herd of them, perhaps 15 or 20. They eventually saw us and moved off the ridge to the north, into no-mans-land. Before they disappeared, Gary got one mediocre picture. Dogs as pack stock - great idea! !